Time for an awesome giveaway here on iPad Insight! Starting today we’re running a contest for (10) Acrylic Smartphone Coasters. We all have smartphones these days. It doesn’t matter if it’s an iPhone, Android or some other brand you’re fond of–most owners typically want to keep their smartphone handy and within reach at all times. Our phones are an extension of our lives, and as a result, we rely on them to help keep us more productive, informed and on task, as well as entertained. So whether you’re working at home or at your desk at the office, it’s always handy to have your phone within reach, and viewable with a simple glance. With these recently released Acrylic Smartphone Coasters the folks at newPCgadgets have designed a simple, elegant coaster, who’s sole purpose is to fulfill that feature–and do it well. The Smartphone Coasters are extremely durable and sturdy, and they even work with many cases, so you don’t have to go through the hassle of taking them off to display your smartphone. *** Just add ONE comment to this post, making sure to fill out the ‘email address‘ field (don‘t worry, it won’t be displayed and we won‘t use it for any other reason than to contact you if you win) “ and you‘re in with ONE entry for our random drawing of (10) seperate Acrylic Smartphone Coasters on Wednesday. This contest is open to residents of the continental United States and Canada. Sorry, no international shipping. We’ll draw our winner on Wednesday (4/20/16) sometime after 10:00 pm US Eastern time. Special thanks to the folks at newPCgadgets for their generosity! Since signing up for insight’s emails,i have been informed and pleasantly surprised with all that has been given towards enriching my use of my iPad. Thank you! I enjoy my daily visit to iPad insight obtaining useful info and updates ! Thanks for the great contest and blog! This acrylic stand would have its place in any home! I also enjoy reading your blog and have found new useful features on my iPad. 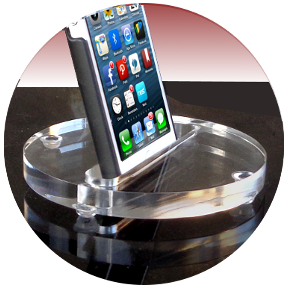 The acrylic coasters are cool…perfect for a desk! I like the idea about a way of keeping a phone vertical. This is a great UDL idea for people who might need to see their phone while doing other things. love how you show great products for our phones and ipads! Very cool item! I would love to have one on my desk at work. Thanks for the great contest and the great blog. Like the minimal look of these! Increasing my odds by allowed limit, sorry Burt decreasing everyone else’s odds just a bit. I like the clean lines and would love to win one. Great stuff on your sight. Would like to win a coaster! Thanks for the giveaway! Classy looking on home or work desk!